Jennifer Kotler Clarke is the Vice President of Content Research & Evaluation at Sesame Workshop, the nonprofit educational organization behind Sesame Street and other educational initiatives for children. Jennifer leads a team of researchers who conduct research projects across the globe focused on a variety of curricular areas and media. They translate data to insights to specific recommendations to maximize the impact of Sesame Workshop’s content around the world. Prior to joining the Workshop, Jennifer worked on an evaluation of a school-based violence prevention program at the National Center for Children in Poverty at Columbia University’s Mailman School of Public Health. 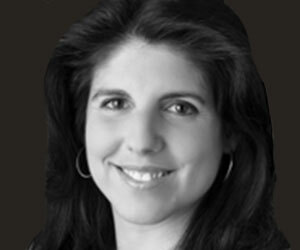 She has worked with numerous organizations such as the Center for Media Education, the Center for Research on Influences of Television on Children at the University of Texas in Austin and Georgetown University, where she coordinated the Children & Media Project while completing a postdoctoral fellowship. Jennifer also taught media and child development courses at the Teachers College at Columbia University and Georgetown University. Jennifer graduated from Cornell University with a BS in Human Development and Family Studies. She went on to receive her master’s in Human Development from the University of Kansas and a Ph.D. in Child Development and Family Studies from the University of Texas at Austin.